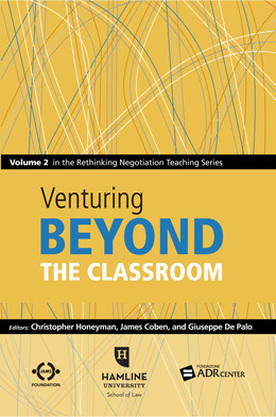 Venturing Beyond the Classroom is the second volume in the Rethinking Education Teaching series. Edited by Christopher Honeyman, James Coben and Giuseppe De Palo and with 37 contributing authors, this volume puts into practice a series of experiments described in the project's previous book, Rethinking Negotiation Teaching. It also offers a warts-and-all analysis of how the initial experiments didn't always work -- and what should be done next to improve these new teaching techniques and topics. The book is available through Amazon.com (directly via this link, with free shipping.) PDF copies of all chapters are without charge, thanks to the generous financial support of the JAMS Foundation. Published by DRI Press, an imprint of the Dispute Resolution Institute at Michell Hamline School of Law. Copyright: There is no charge for use in teaching or training, provided that copies are distributed at or below cost, you notify the publisher (sharon.press@mitchellhamline.edu) that you are using the material and describe the context, and you provide attribution as follows: Copyright 2010 DRI Press, Mitchell Hamline School of Law, Author and Chapter Title. Description from DRI Press: In October 2009, more than 50 of the world's leading negotiation scholars gathered in Istanbul, Turkey for the second in a series of three international conferences designed to critically examine what is taught in contemporary negotiation courses and how we teach them, with special emphasis on how best to "translate" teaching methodology to succeed with diverse, global audiences. In organizing the Istanbul conference, we took particular note of a consistent strain of criticism of the artificiality of a classroom environment, which became a running theme of many of our authors in the project's first year, captured in the previously published RETHINKING NEGOTIATION TEACHING: INNOVATIONS FOR CONTEXT AND CULTURE (DRI Press 2009). It would be hard to imagine a better environment for trying something new and different outside the classroom environment than Istanbul, and we tried to do honor to one of the world's greatest trading cities in our design for the conference. In brief, we dispatched small teams of scholars into the city's famous bazaars, for one exercise in studying how negotiation might be taught more actively, and dispatched teams into the city's less touristy neighborhoods on another occasion, with instructions that required each team to negotiate internally. The resulting rich collection of scholarship is gathered in our current title -- VENTURING BEYOND THE CLASSROOM. 5. Can We Engineer Comprehensiveness in "Negotiation"Education? 19. Emotions - A Blind Spot in Negotiation Training? 23. Should We Trust Grand Bazaar Carpet Sellers (and vice versa)?